INTRODUCTION TO PROGRAM: Welcome to the Program! 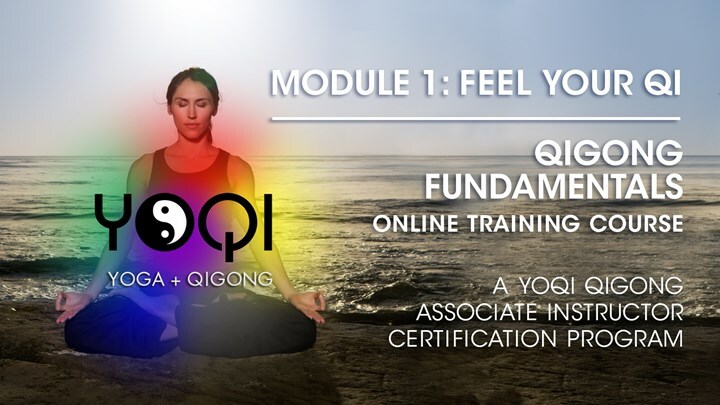 Meet Marisa and get an overview of the YOQI Module 1 Training Course. The PDF download manual for Part 1: Introduction Series includes an appendix with reflection questions to be answered by all instructor trainers. LECTURE VIDEO: What is Qi? What is Qigong? In this first video we will dive deep into the history, theory and styles of qigong as well as define YOQI in the context of qigong. The foundation of all meditation and qigong practice is awareness. But what is awareness? In this introduction to the practice, Marisa explores the meaning of awareness, why cultivating it will enhance your practice and how to do it. The first step in qigong training is to learn how to sense and feel qi. Feeling qi is nothing more than training to sustain bare awareness in the present moment. This guided audio meditation is a training method designed to help you awaken your awareness. Sustaining a balanced and smooth energy flow between relaxation and concentration, unified through awareness is the key to success in this program. I recommend you do this meditation for at least 21 days before moving on to the next internal meditations. By awakening your awareness you will lay a strong foundation to build your qigong practice. PRACTICE TUTORIAL: The first step to working with qi is to be able to feel qi. We are all born with the ability to sense and feel energy. Learning how to feel qi will help you to become more sensitive to the frequency patterns in your body and energy field. There are specific places in the body that are sensitive to feel qi. In this practice you will learn the simple technique to activate your qi hands and make a qi ball. This exercise is a common qigong practice taught to beginners by my masters. LECTURE VIDEO: The foundation of all dynamic qigong is standing. Standing aligns the body to the Three Forces: heaven, earth and humanity. When we are aligned with heaven and earth, the human body is a conduit of energy. The ability stand effortlessly for long periods of time is a sign of internal progress in qigong. If the body parts are not properly aligned during our practice, energy does not flow properly and can even become stagnant or blocked. Most of the areas where these blockages occur in a beginner’s practice are in and around the joints. In this video you will learn how to stand in Wuji posture by applying the Five Keys to Maximize Qi Flow. PRACTICE TUTORIAL: The foundation of all dynamic qigong in this course is standing. Standing aligns our body to the Three Forces: heaven, earth and humanity. When we are aligned with heaven and earth, the human body is a conduit of energy. The ability stand effortlessly for long periods of time is a sign of internal progress in qigong. If the body parts are not properly aligned during our practice, energy does not flow properly and can even become stagnant or blocked. Most of the areas where these blockages occur in a beginner’s practice are in and around the joints. In this video you will learn how to stand in WUJI posture by applying the 5 Keys to Maximize Qi Flow. PRACTICE VIDEO: A 20 minute voice over guided practice that can be done daily. The foundation of all dynamic qigong in this course is standing. Standing aligns our body to the Three Forces: heaven, earth and humanity. When we are aligned with heaven and earth, the human body is a conduit of energy. The ability stand effortlessly for long periods of time is a sign of internal progress in qigong. If the body parts are not properly aligned during our practice, energy does not flow properly and can even become stagnant or blocked. Most of the areas where these blockages occur in a beginner’s practice are in and around the joints. LECTURE VIDEO: YOQI is based on the qigong style called Qigong Flow. This lecture covers yin-yang theory, Qigong Flow theory and how to apply the Five Keys to Maximize Qi flow to movement. We will be applying these basics throughout the course . PRACTICE TUTORIAL: This live tutorial guides you through the Five Keys to Maximize Qi Flow through the practice of three beginner Qigong Flow movements. The routine starts with warm ups to open the spinal cord and release stagnation. LECTURE VIDEO For thousands of years civilizations around the world have created diagrams to map out nature’s energetic code. In this lecture video we will explore the Taoist creation map of the Universe, the Three Forces, the Five Element Phases and the Three Dantian. Attached to this lecture is a diagnostic to discover your element. A diagnotic test to discover the dominant element of your personality and body type. This information will be helpful for you to reflect on your own constitution and conditioning throughout the course as we learn the Six Phases of Qigong Flow. PRACTICE TUTORIAL: This video is a guided tutorial to dive deep into Energy Medicine practices and the Dantian Activation Exercise. Cultivating your Three Dantian is the most important neigong training to understanding your true nature. If the dantian are not activated during your qigong practice, then the movements are not really energy cultivation, they are just exercises. This Dan Ming Qigong exercise is designed to activate the surface points of the Three Dantian. Part 1 begins with Energy Warm ups to clear stagnation, open the reservoirs and get our energies moving in their natural flow. Part 2 is the Dantian Activation. PRACTICE VIDEO: This video is a shorter version of the Dantian Activation routine to accompany the tutorial that can be practiced daily during this first phase of training. LECTURE VIDEO: There are six phases to cultivate energy called the Six Phases of Qigong Flow: Attune-Purge-Tonify-Grow-Circulate-Integrate. Each phase corresponds to the classical qigong training method of regulation. This lecture will explore each phase and how it applies to a qigong practice. Understanding the six phases will help you to choose daily practices, design your own qigong routines and teach others. PRACTICE VIDEO: Now it’s time to practice all Six Phases of Qigong Flow in one routine. The practice video that goes with this lecture is designed to cover the material we have learned in the Introduction Series. It is a deep and meditative session so find a comfortable place and let's move some qi! This lecture explores the principle of Attunement : Awareness, Dynamic Relaxation and Grounding. The element of Attunement is the Earth Phase. In this lecture we will look at all aspects of the Earth Element: Physical, emotional and mental. An audio meditation that will guide you through the basic steps of natural diaphragmatic breathing and full dantian breathing. Dantian Activation 1 is a designed to energize the Vitality Qi, remove cold stagnant Qi, and build energy in the lower dantian. It is the foundation practice to prepare for circulating the Microcosmic Orbit (Small Heavenly Circuit). Note there is an audio version download attached to this video. A Nei dan breathing method to activate the Qi in the Lower Dantian and clear stagnant cold energy.